It was 10:00 PM and we had just finished dinner at Landulphi, a great space that resonates with its medieval heritage. 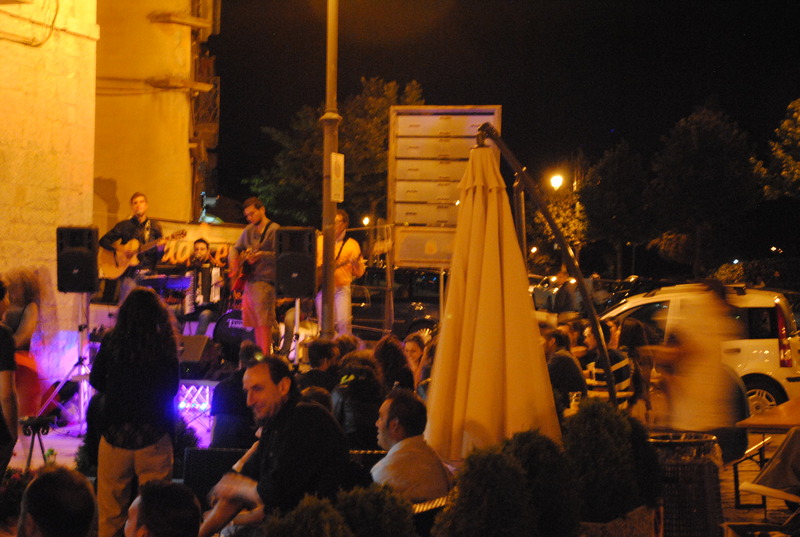 Outside Piazza Roma was a buzz of activity. Picnic tables were crammed in front of Bar Elimar. A lit bandstand filled one section of the sidewalk. Tots in strollers, pre-school hellions chasing each other throughout the crowds, moms, grandmas, twenty and thirty-somethings and tweens edge closer to the action. Crowds creep in closer to hear not Rock ‘n Roll but rocking traditional music. 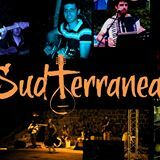 Tonight, that action was a sweet group of young performers – I’m guessing music conservatory instead of university students – wailing out traditional Italian music on the accordion, all sorts of percussive instruments and electric guitars. Boy was I happy I had on a white shawl. It gave me something to hold up as I too did my whirling dervish routine. Weeee – I almost but not quite worked off the calories I gobbled down at Landulphi. It was interesting that this bit of performance art popped out of nowhere on this particular day. Earlier – on a Skype call with my friend George Hansel about producing his new cabaret act, Burly Man Sings Girly Songs: My Life as a Show Tune Queen and Sexual Outlaw, (yes that was a plug) George raised a devastating question. George has the greatest laugh in the world. See his show and laugh with him. Could I really live in a small village with no easy access to the cultural richness of New York and Philadelphia? Hey, I bellowed back, I grew up in Flagtown, NJ – a small village with easy access to culture and an uncle who worked for the then New York Mirror and got free tix to stuff. Ask me how often we actually got to go???? George also, reminded me that I have the attention span of a gnat and boredom can easily weasel its evil sighs into my soul. I explained that during my last bout of boredom I realized that if I was bored it was my fault. All it took was a walk down to the village with my laptop in tow to chase the boredom away. Just sitting at a bar (cafe) surrounded by village life and listening, watching and being perpetually surprised at the instant art that pops up can get my creative juices flowing and the deeps sighs disappearing. Living in New Jersey with easy access to my state’s professional theaters and being able to zip into both nearby cities, is indeed terrific. But how often do we really do it? Finances come into play. Tickets are expensive, add travel, or driving costs and suddenly an opportunity to experience art is fiscally out of the question. Here in Pontelandolfo, the fiscal crisis has folks pinching euros. Yet, art is accessible to them. They often create it themselves. Site specific theatre produced by the town’s twenty-somethings took place in a variety of outdoor locations. The audience moved from scene to scene. Sponsored by bars, community groups and Pontelandolphesi living in the USA and Canada, there seems to be music, dance, theatre and visual art happening weekly. 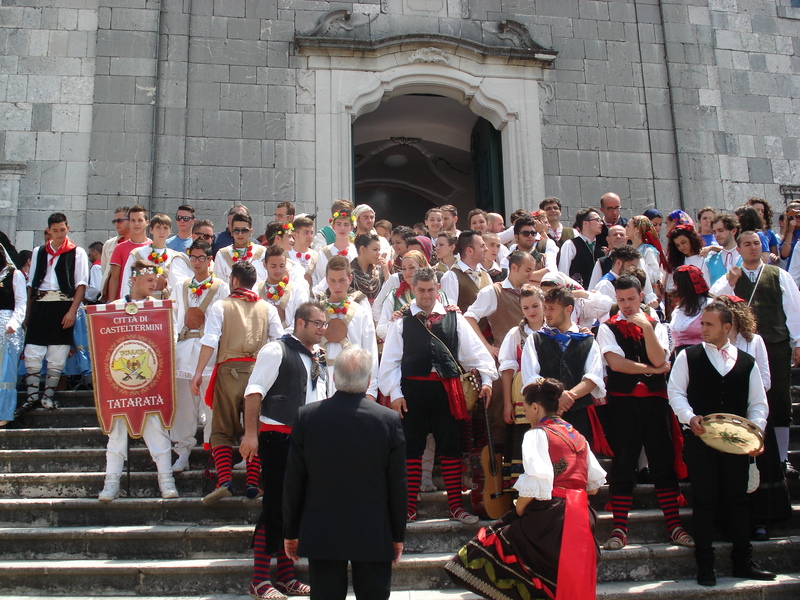 Look for upcoming blogs on many of those events including a two part blog on Associazione Culturale Ri Ualanegli – our dance company – and the week long national folk dance festival. 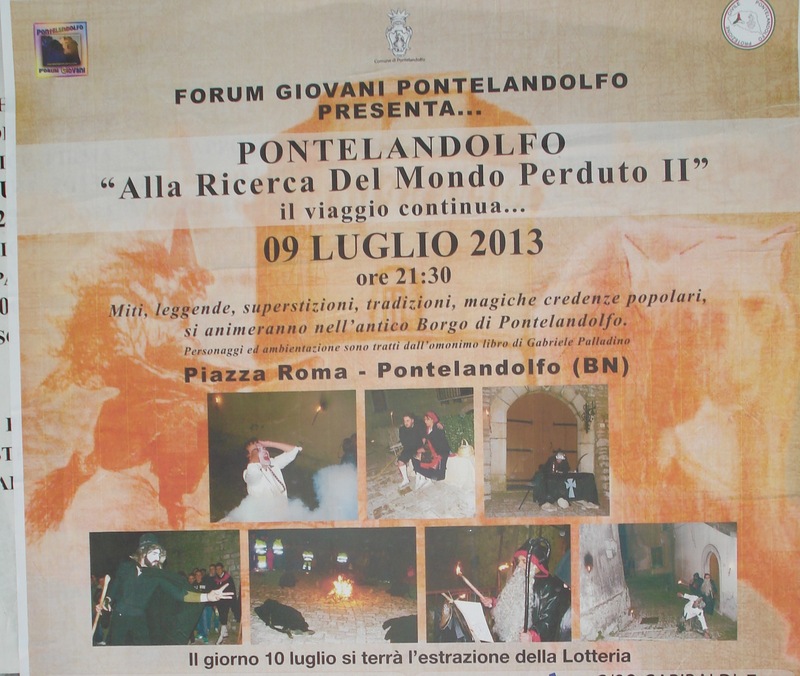 Folkloric dance companies from throughout Italy performed in the Piazza nightly for almost a week. Here they are on the church steps after mass. A quick peek at http://www.eptbenevento.it/archivio_eventi_mostre_benevento.html – the EPT Benevento (ente provinciale per il turismo) events website – lets me know that other villages in the province also are bringing in art. Campania, the region we are in, even has an “art card” – http://www.campaniartecard.it/ – reduced rate admissions and listings. A short drive over the mountain takes us to Cerreto Sannita where di antica tradizione ceramica lives on. Artisans freely open their studios to folks like me to watch and learn the process – note FREELY. We boldly knocked on a studio door and the artisan, Pietro, welcomed us into his space. 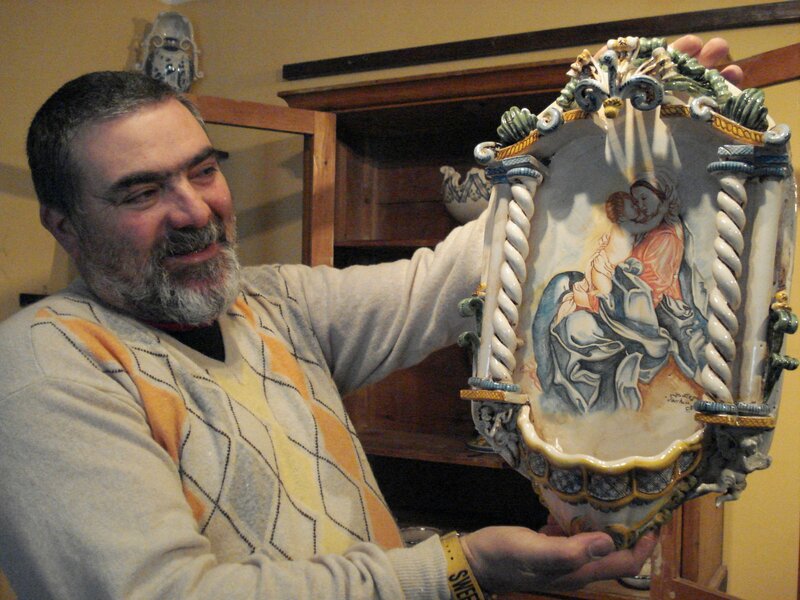 Pietro is proud of the ceramic history of Cerreto Sannita. 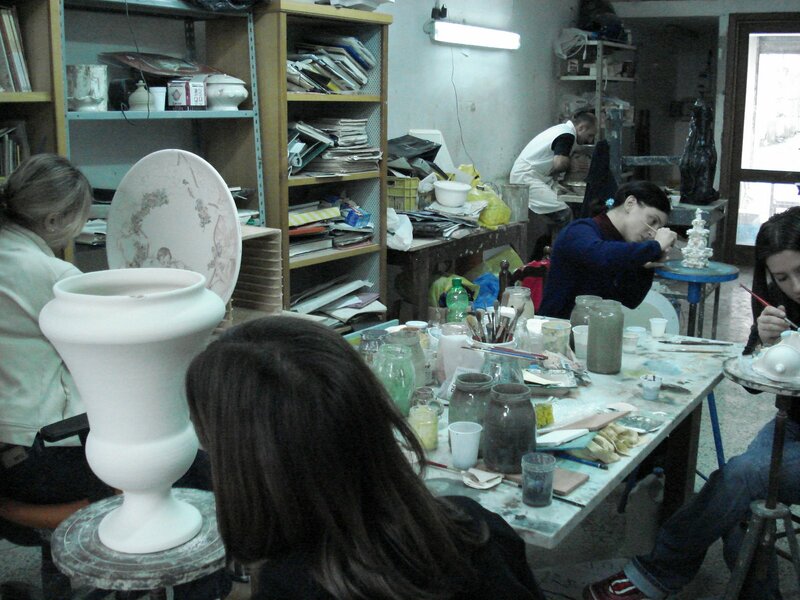 After touring his studio he literally opened the doors to the closed ceramics museum and shared that with us too. 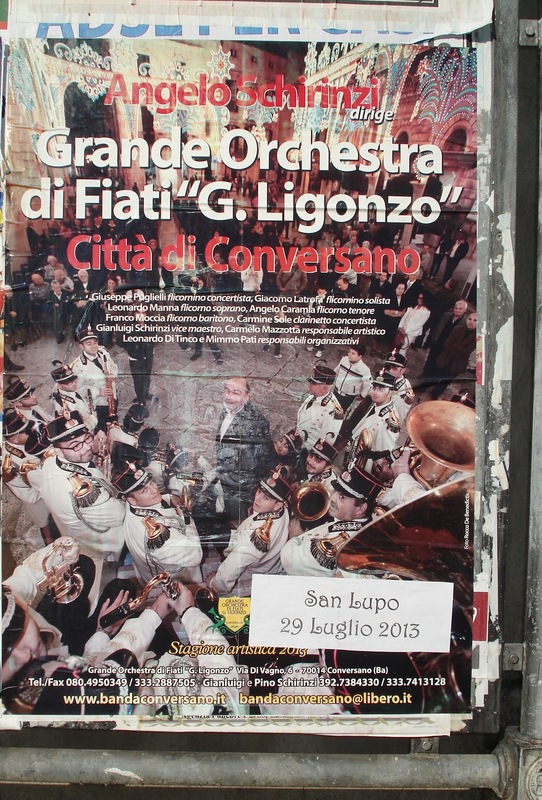 San Lupo – just a scant 10 minutes over curvey mountain roads – sponsors a annual classical music festival. Music fills the hill top streets. How much are the tickets? Nada!, Niente!, Bupkus! 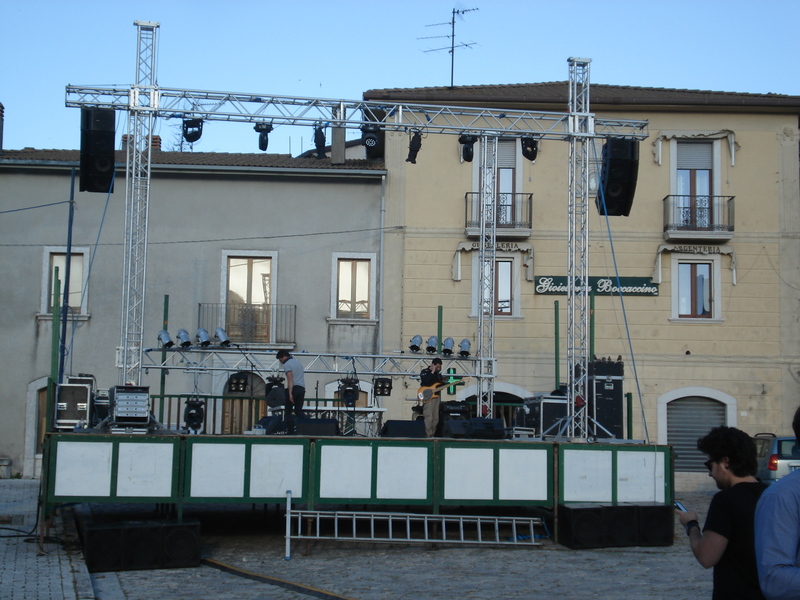 Damn, we missed the theater festival in Amorosi – a 20 minute or so trek down the mountain. They do charge for tickets and bring in professional companies from as far away as the USA. (http://www.amotefestival.it/) Next year we absolutely will get tix to something and report back. The bottom line is that art and culture is just a matter of everyday life in Italy – even in the smallest villages. There is public art everywhere – our village has three large installations. Of course, the remnants of Ancient Rome are everywhere too. Band stand is getting set up. I wonder what will be happening. 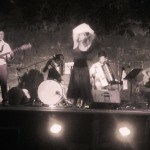 Revisit some of my earlier stories – Circo acquatico, San Antonio Festival, Calcio – stuff just happens here and I don’t have to pay the tunnel tolls, gauging parking fees and high ticket prices to drink in all this culture! 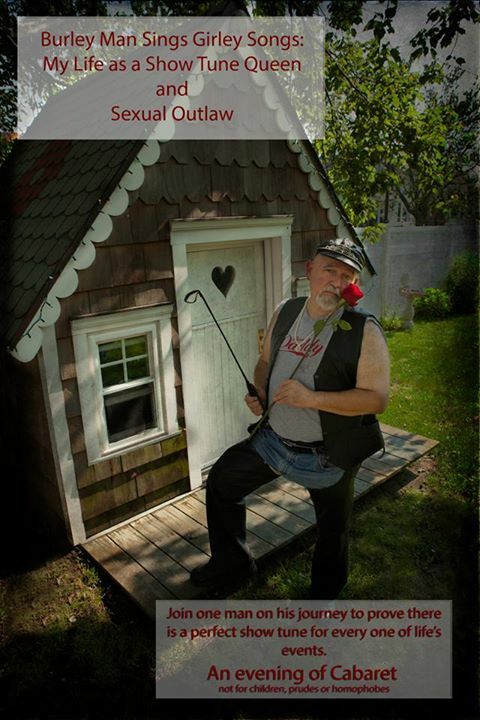 Like my New Jersey ArtPride pals say – Be a Culture Vulture – I am and I am loving every second. So, dear George, I think I can really live in a small village with no easy access to the cultural richness of the tri-state area. Of course, we do have to figure out a way to get your one man cabaret act across the pond. Previous postOur Salumeria – More Than Just Cold Cuts! So does this mean you’re settling in in Pontelandolfo for the foreseeable future? I have the same question? Your comments beg the question. You are not coming back in the near future or for a year or two or for an extended undetermined time. Midge, sounds like you and Jack have found nirvana – delicious food, live music, friendly people, cheap entertainment, lotsa wine … You’re right. Who needs noisy, smelly subways, traffic, exorbitantly priced Broadway shows and restaurants, jaded people, and on and on? But we hope you won’t forge your loyal old Jersey friends!